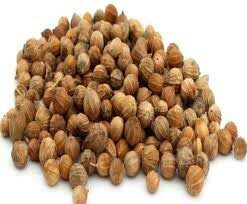 Coriander Seeds are highly acclaimed for their health benefits and medicinal properties. We are an unsurpassed Supplier and Exporter of Coriander Seeds from Thailand. The Coriander Seeds offered by us are 100% pure and quality enriched. Coriander Seeds have anti-oxidant properties which promotes healthy functioning of the liver and bowel movements. We are capable of delivering bulk orders of the Coriander Seeds within allocated time.